Oxidizers designed to use a catalyst to destroy VOCs at lower temperatures. Likewise, facilities that have special requirements can consider using an Electric Catalytic Oxidizer since this system is powered by electric heaters and offers an alternative to natural gas. When to use a Catalytic Oxidizer? A Catalytic Oxidizer may not be appropriate for treating air which contains particulates as they may coat the surface of the catalyst in effect masking it and preventing the VOCs from chemically reacting. Certain materials may chemically react with the components contained in the catalyst. This reaction can consume the active sites and permanently damage the catalyst. Some of the more common industrial applications include Painting & Printing operations as well as Coating and Laminating. 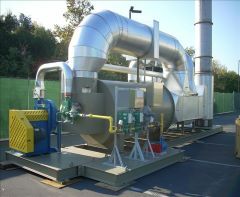 Take a look at Pollution Systems' Thermal Oxidizers if you think that a Catalytic Oxidizer isn't what you're looking for. Pollution Systems can evaluate your control requirements and if appropriate provide you with a new Catalytic Oxidizer specifically designed for your process application. The systems we offer combine high quality designs and construction while focusing on reliability and ease of operation, without disregarding your timing requirements.